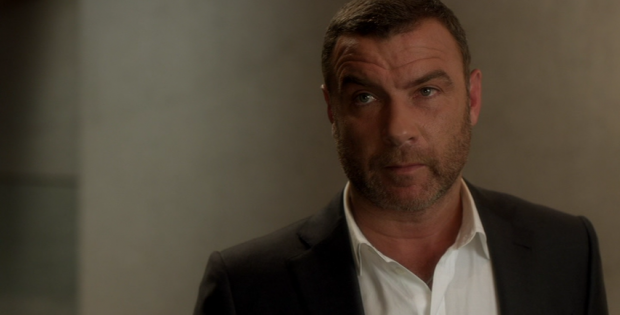 When Liev Schreiber took the title role of Ray Donovan he risked a lot. While he had a steady acting career, he was best known as the Wolverine’s brother. But more importantly was the fact that he was the voice of HBO. He narrated the original sports documentaries and other projects on the pay channel. But when word came out that Ray Donovan was airing on rival Showtime, HBO silenced his voice. He was willing to put a steady gig behind him. With the release of Ray Donovan: Season Five and a sixth season in production, Liev the risk has paid off. He’s probably now called “Ray Donovan” in airports instead of kids asking him if he knows the Wolverine. The fifth season begins after the massive exploits of the fourth season that involved a mobster takedown. He’s back to just being a Hollywood fixer having to deal with too many family issues. He’s got a wedding and a kid in military school. While stuck in a court appointed rehab for anger, he reflects on his married life with Abby (Paula Malcomson). His brother Terry (Eddie Marsan) dealing with his nervous issues. Even worse, his father (Jon Voight) wrote a script and wants to get into the showbiz game. There’s a massive tragedy that tears Ray apart. Even his case load isn’t simple anymore as the famous keep messing with his plans. There’s nothing easy in his bruising life. Ray Donovan keeps up what has made the show a hit. The feeling that no matter how much Ray fixes things, nothing gets solved. One fire goes out and another fire explodes. Even when Ray has someone’s back, there’s a major chance his will be left unprotected when it needs to be watched. Liev put so much on the line and was lucky enough to make it the career defining role of his career. The video is 1.78:1 anamorphic. The transfer brings out the bruises and scratches on the various actors. The audio is Dolby Digital 5.1. There’s a lot of body blows mixed just right. The episodes are subtitled. Commentary Track on episode 508 with Paula Malcolmson and David Hollander. Dog the Dog (2:13) exposes what the dog in the show’s real name is. Nothing Goes Right for Bunchy (3:03) is about his frustration of his role in town. Terry Donovan and Parkinson (3:03) goes into what shaped the way the actor portrayed the signs of Parkinson’s disease. On Death & Dying (7:42) & (8:51) has cast and crew talk about creating a mystery to what could have been just a normal sickness storyline. The piece gets touching as Liev reflects on slowly losing a cast member during the scene. The producer fears what will happen with the character no longer part of the story for next season. Showtime & CBS DVD present Ray Donoavan: Season Five. Starring: Liev Schreiber, Paula Malcomson, Eddie Marsan and Dash Mihok . Boxset Contents: 12 episodes on 4 DVDs. Released: February 6, 2018.